This is an extraordinary election year. There is horror and there is hope. These elections will mark either a step toward or a step back from growth of fascism in our country. The CPUSA National Committee is charged with adopting a strategic plan that will engage the entire Party in the 2018 elections and in movement building. We lay out our plans as an outpouring of protests and actions across the country usher in the year — from Martin Luther King Jr’s birthday marches to the Women’s March featuring many first-time grassroots women candidates, to nationwide protests of the tax scam and the budget deal which failed to fund community health centers, protect the Dreamers or provide relief for Puerto Rico. Such expressions of unity and solidarity are key to defeating the policies of the Trump administration and Republican Congress which are rooted in racism, division and bigotry. They are looting our economy to benefit the .1% and the Military-Prison-Industrial complex, limiting democratic rights and hurting millions of people. 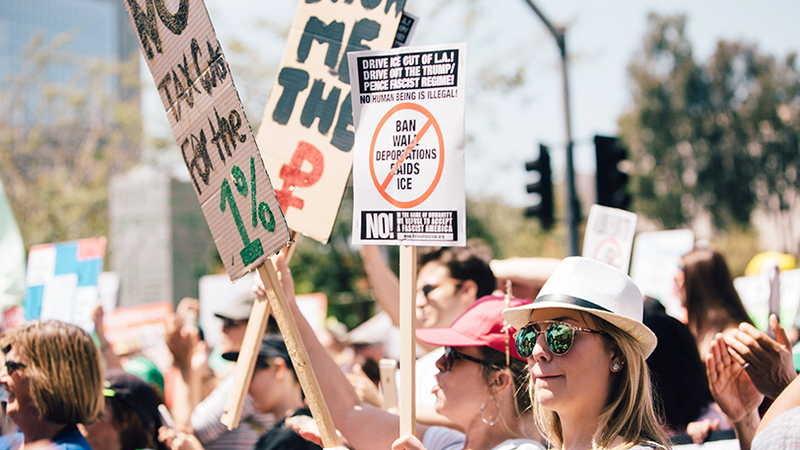 When people see their common interests, these policies can be successfully challenged, as was shown when the Muslim ban and repeal of the Affordable Care Act were blocked last year. There is an urgent danger that the extremist right-wing section of capital is using the Trump presidency, which is based on white supremacy and America First, to consolidate a mass fascist movement organizationally, financially and politically in our country. We have a responsibility to adapt and employ the united front strategy in today’s conditions while at the same time organizing onto the offensive for a radical restructuring of our economy and society to the benefit of all. At the fore is raising class consciousness and rejecting race baiting, union hating, misogyny, anti-immigrant bigotry and national chauvinism. Rep. Keith Ellison says: “human solidarity is the best weapon against Trump.” It is good to hear the deputy chair of the DNC calling for door-to-door organizing, listening to people’s concerns and sticking with them year round. It is possible to flip red election districts if there is a clear and bold people’s program plus a collective effort to get out the vote with a goal of continuing to organize after election day. In today’s fight to defeat the billionaires, generals and demagogues we also realize the need for fundamental change because racism, exploitation and war are embedded into capitalism. In fact, fighting for immediate needs and democratic rights today is a necessary part of the struggle to expand those rights much further and replace capitalism with socialism. The bigger and stronger the Communist Party, the more we can help build class solidarity within the broad front and share our vision of socialism — that those of us who create the wealth should determine how it is used and how everyone benefits. This election is an organizing opportunity both for the broad movement and for the Communist Party. The more we Communists are involved the better we can increase our numbers, expand the People’s World and become more effective leaders for class consciousness and solidarity. Appreciation to the Political Action Commission, the National Board discussion, and to the 14 districts that have submitted election surveys so far which are reflected in our 2018 Election Plan. A widespread, determined movement is emerging in 2018 aimed at ending extremist right-wing Republican control of the House and Senate, and electing progressives to state houses and local offices across the country. Thousands of people, horrified by Trumpism, and buoyed by the growing resistance, including many young women, African American and Latino, union members, and LGBTQ, have been inspired to get involved in politics and run for office. The main arena of class struggle in 2018 is in organizing and building unity to stop the all-out assault on the multi-racial working class by changing the balance of forces in Congress, state legislatures, and local government. The Communist Party should be in the thick of this battle, expanding the electorate, organizing around a united people’s agenda, bringing out the vote, raising class consciousness and developing new working-class leaders and candidates. They will continue their attacks to slash access to healthcare, Social Security, union representation, voting rights and all social and civic programs. Everything the working class has won since the election of FDR is threatened. Even public education, the most traditional democratic institution since the 19th century, is on the chopping block. They deny any need to protect our environment; they are out to terrorize all immigrants, refugees, and people of color; they condone hatred and abuse of women; and they openly support old and new white supremacist, racist and fascist, Klan-like movements. The Trump administration and Congressional allies continue to advocate for increased wars and militarization bringing the world to the brink of nuclear annihilation. The fightback requires building the broadest possible coalitions, with labor at the fore, to confront and resist these attacks at every level: in Congress, the White House, state governments, and in our communities and streets. The far-reaching nature of the attacks creates this potential, as shown in the elections in Virginia, New Jersey, and with the defeat of Roy Moore in Alabama. So too with the local election of many progressive women, African American, Latino and LGBTQ candidates. Extremist right-wing elements can be defeated when the grassroots mobilize on issues of immediate concern with person-to-person campaigns to turn out the vote. Victory in November will require campaigns not only advocating defense from corporate assault, but also a peoples’ platform including such demands as union jobs, single payer healthcare, immigration reform, police accountability, an end to homelessness, environmental sustainability, taxing the rich and corporations, reallocating money from the military budget to human needs, and securing voting rights for all. The resistance must come from uniting the new coalitions like “Fight for 15” and “Black Lives Matter” and many new forms bursting forward with progressive forces coming out of the Bernie Sanders campaign and the many new electoral forms growing out of the resistance in concert with the ongoing struggles of the core forces for social change: labor, African American, Latino, Asian American Pacific Islander; Native American; women, youth, LGBTQ, immigrants and other progressives. Climate change and the threat of nuclear war are threats that require urgent action by worldwide coalitions if we are to save the planet. These struggles are where people learn class consciousness. Some national mobilizations bringing together social justice and voting in 2018 where the Communist Party should have a presence include the Jan 20-21 Women’s Marches Power to the Polls; the April 4th marches on the 50th anniversary of the assassination of Dr. Martin Luther King Jr; the Poor People’s Campaign led by Rev Barber;from Mother’s Day to the Summer Solstice; People’s Climate Mobilization for Climate, Jobs, Justice on September 8; and many union contract and organizing drives. The Communist Party should be an active part of these coalitions. We should keep pushing for the greatest possible breadth and unity against the ruling class onslaught. Our role is to become part of these struggles; our involvement can strengthen these movements and help develop socialist consciousness, while also growing the CPUSA. The national Party leadership and the Political Action Commission should work with the districts and clubs to develop strategy and tactics based on local conditions. If two seats in the Senate flip Republicans will lose control. If 24 seats in the House flip Republicans will lose control there. Part of the equation is the large number of Republicans stepping down leaving open seats, some because of sexual assault charges, some who believe they may be defeated, and some who do not go along with the extremism of Trump. This section lists a lot of progressive PACS who are encouraging and supporting candidates at all levels. Some are established, some are new like Our Revolution coming out of the 2016 election and the resistance to Trump’s agenda. Hundreds of women have stepped up for trainings and are ready to run, working with organizations like Politica and Emily’s List. Progressive and left women, African American, Latina, Asian Pacific and Native women bring their human values, priorities and strength to the fight for justice and equal rights. In Georgia, the African American woman minority leader in the state house is running for governor with the support of MoveOn, AFL-CIO, Working Families Party, many elected officials and others. She would be the first African American woman governor in the nation. Perhaps a team from People’s World could go in to cover this. We place special significance on the AFL CIO’s Labor 2018, Working America and the Working Families Party because they are tied with the multi-racial union movement. In California and Connecticut, two high profile women union leaders are running for state senate, and many dozens more are running in local races. Some unions are adding a push for members to run for public office as part of their regular member contact. Crisis issues of climate change and the buildup of the nuclear arsenal and military budget are also pressing in this election. At the state level, the highly funded right-wing ALEC is pushing hard for its anti-union right to work (for less) laws in every state legislature. When Right to Work passed in Missouri last year, the labor movement and allies including ourselves collected 300,000 signatures and succeeded in getting that issue on the ballot in November. This is even more significant as the Supreme Court prepares to hear the Janus v AFSCME case which could strip public sector unions of the right to have automatic dues checkoff payments from their members. Governor and state legislature races are big battlegrounds. There are nine Democrats, one independent and 26 Republican governor seats up for election. The governing party in each state will be in place to control redistricting in 2020. Gerrymandered districts have been overturned by the courts this year in North Carolina and Pennsylvania. The battle in North Carolina has been long fought, including years of marches, civil disobedience and legal actions, led by Rev William Barber. It reminds us that with a united fight it is possible to win even in the most difficult conditions. Our local Party organizations have contributed to many of these struggles. Our experience is that where we participate we are welcomed and appreciated. This year we have candidates running for office in non-partisan races or on other slates in Arizona, Texas, Ohio, Connecticut and probably more. Some are new to the Communist Party, some joined after they were already candidates. Some are candidates for Congress and some are candidates for precinct committee or ward chair. The Political Action Commission is prepared to stay close with these to help develop our unity strategy and tactics and to learn lessons that will help us field more candidates in the future. Our national priority races reflect what each state and district single out for participation. We want to help build the broadest coalitions possible to flip Republican districts, protect working-class champions, and support progressive primaries in safe Democratic districts. At the same time, we look for ways to expand our own base for long term organizing. Elections are a great time to talk with neighbors and co-workers and introduce them to People’s World, invite them to our national education webinars, club meetings, rallies, events, and door knocking as part of the coalition efforts. So far 14 districts have returned the survey about their election work this year. Each one indicated that they are working in coalition with labor and community forces in their area. Minnesota has the Governor and two US Senate races to protect (Tina Smith will be running to finish Franken’s term). They are also working to flip the state legislature. The battle is to block attempts to make Minnesota become a “right to work” state. Washington State, Colorado, Pennsylvania and Connecticut are working to decrease Republican presence in the legislature and maintain governors as Democrat. Washington also is focused on flipping two or three Republican held house seats. Voting rights. Active participation with organizations and coalitions to end voter suppression in all its forms and restore the Voting Rights Act. Webinar in April (With national education department). Elections are being stolen by voter suppression methods used against African American, Latino and youth especially. Voter registration is a big way that our clubs and our Party can contribute to expanding the electorate and speak with people about the importance of their vote and of getting involved. Some clubs are setting goals for how many voters they hope to register. Like his whole economic plan, Trump’s infrastructure plan is a war on workers, geared to privatize and enrich contractors and Wall St. not communities. H.Con.Res.63 Supporting Efforts to Enact a Bold Jobs and Infrastructure Package that Benefits All Americans Not Just Billionaires has 155 co-sponsors. It was introduced by Rep Ted Lieu of California last spring for $2 trillion over ten years which would create 2.5 million jobs in the first year. It now has a coalition behind it: MillionsofJobs.org with a list of ten principles. It is connected to the Congressional Progressive Caucus: 21st Century New Deal for Jobs. Infrastructure and Jobs which is government funded, paid for by closing corporate tax loopholes. It prioritizes racial and gender equity, environmental justice and worker protections. Working with this coalition we can help to expand the endorsers and co-sponsors and make it part of the election debate. The issue of jobs cannot be ceded to Trump. Immigration Subcommittee. Expand. Continue to network with national and local organizations on sanctuary cities, campuses, community work with churches etc. in mobilization to resist deportation. Get Myths v Facts English/Spanish together posted on cpusa.org and share. The racist attack on immigrants is ratcheting up with the attack on sanctuary cities. increasing deportations, holding Dreamers hostage to building the wall, more stringent entry, the Muslim ban, as a strategy to “make America white.” The organizing by young immigrant groups is amazing. Defense of immigrant rights has the formal support of labor but needs to be expanded. We give full support to the Dreamers. A new committee member from Arizona is helping strengthen our work. More participation is needed. Purpose to provide support, share legislative accomplishments and challenges, encourage our own members to run for public office by knowing they have a support network. The core forces for social change that we have emphasized for many years, feeling the brunt of the attack are stepping forward. In our election work, we also prioritize expanding our grassroots base among the core forces for social change (labor, African American, Latino, Asian Pacific Island, Native American, women, youth) in cities, suburbs and rural areas so that the Communist Party and People’s World can grow and be more effective leaders for class consciousness, unity and solidarity. There is a growing radicalization and interest in socialism. We must respond to that with invites to education webinars, invites to club meetings, to go door knocking together, to go to rallies and events together; Write articles and share peoplesworld.org, printed People’s World and other literature. — Meetings. 2nd and 4th Mondays at 8:30 pm eastern. Divide responsibilities. Strengthen composition. — People’s World and cpusa.org. Encourage articles on local people’s movements, electoral and legislative struggles and national mobilizations and conferences we prioritize. Develop opinion pieces. Translate two electoral and legislative articles to Spanish for Mundo Popular each month. Goal to place People’s World at the center of this election for the coalition and for ourselves. (With People’s World Editors). April 4: I AM 2018, 50th year of MLK assassination, Memphis TN. Local actions across the country. Report to the National Committee 1/28/18. Joelle Fishman, is Chair of the Political Action Commission, CPUSA. Joelle Fishman chairs the Connecticut Communist Party USA. 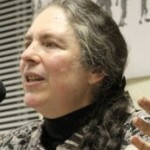 She is a Commissioner on the City of New Haven Peace Commission, serves on the executive board of the Alliance of Retired Americans in Connecticut and is an active member of many economic rights and social justice organizations. She was a candidate for Congress from 1973 to 1982, maintaining minor-party ballot status for the Communist Party in Connecticut's Third Congressional District. As chair of the CPUSA Political Action Commission, she has played an active role in the broad labor and people's alliance that defeated the ultra-right in the 2008 elections and continues to mobilize for health care, worker rights and peace.